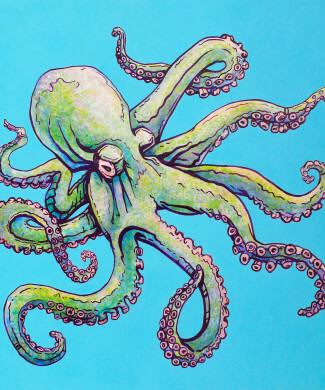 In Hawai’i the word for octopus is “he’e” however islanders commonly refer to it by the Japanese name “tako”. 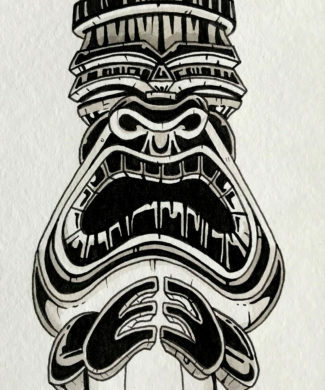 There is even a restaurant on the Big Island in Waimea called Tako Taco, but if you are like me you would never eat one because these he’e are pretty awesome! 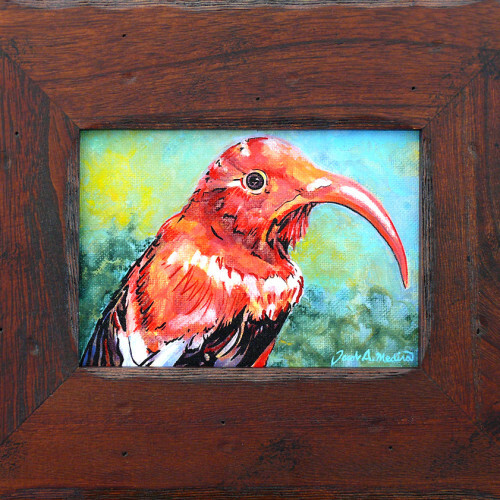 The ‘I’iwi also known as the scarlet Hawaiian honey creeper is one of Hawaii’s most recognizable birds.Unfortunately it is facing near extinction due to habitat loss and the spread of mosquito born diseases.However these birds can still be found in high elevations of the big islands of Hawaii and have been listed as threatened under The Endangered Species Act. 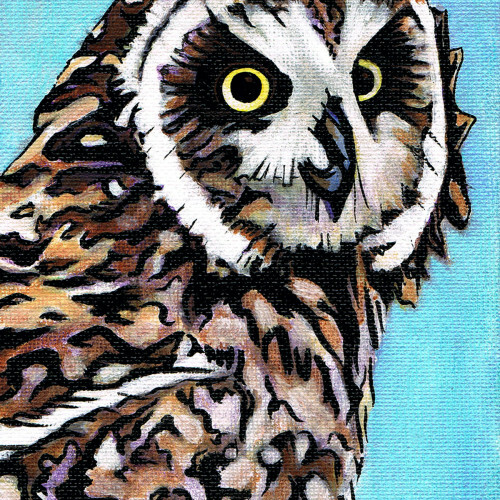 This piece measures 5×7 inches and was painted with acrylic and enamel on a canvas panel. 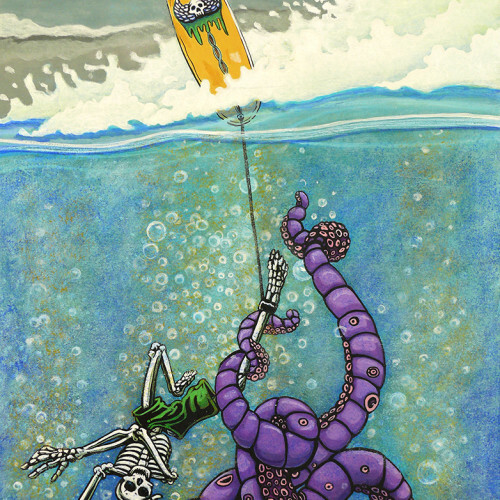 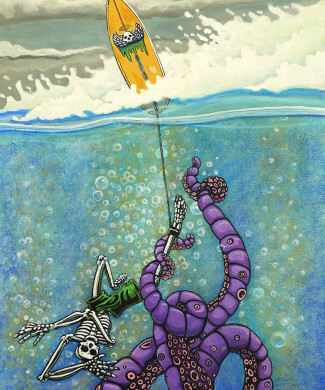 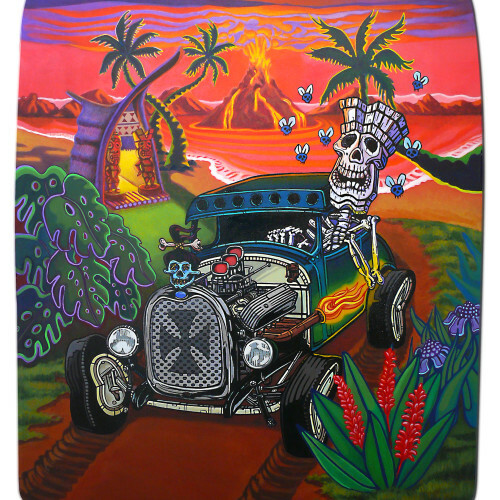 The original work can be purchased at the Volcano Art Center in Hawaii’s Volcano National Park, or on their website here. 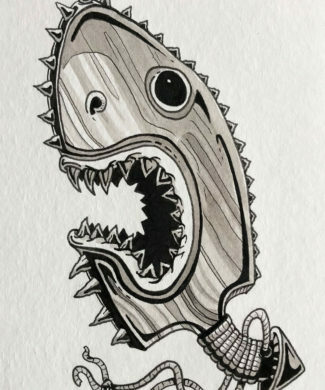 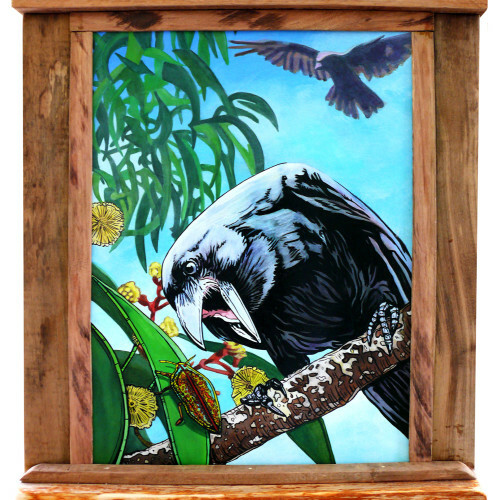 Return of the ‘Alalā depicts three native species from the Big Island of Hawai’i. 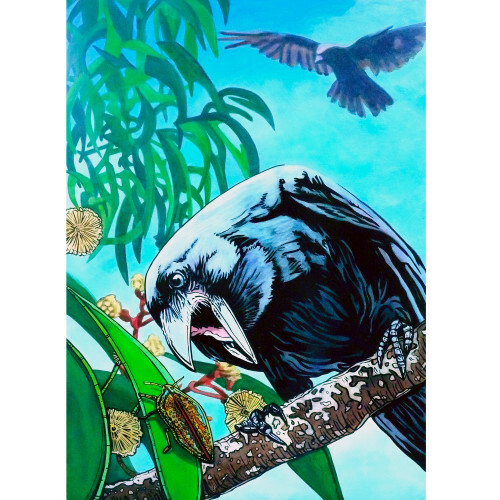 The Hawaiian crow, or ‘alalā, the beautiful Koa tree, and the tree’s little foe the Koa Bug. 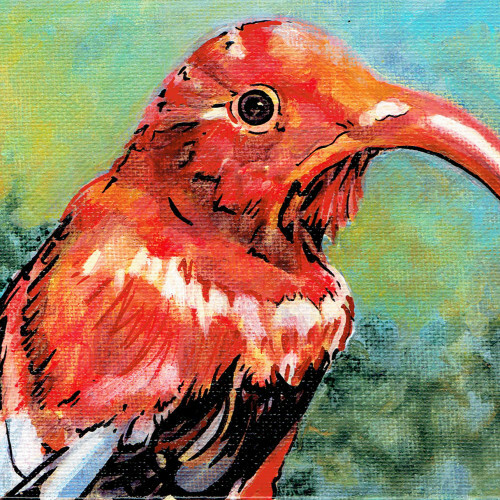 Unfortunately the ‘alalā itself is extinct in the wild and there are only about 150 left in captivity. 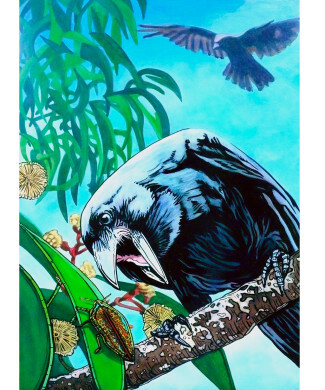 However, there is going to be a release of the ‘alalā back into their native habitat in 2016 coordinated by The Keauhou Bird Conservation Center. 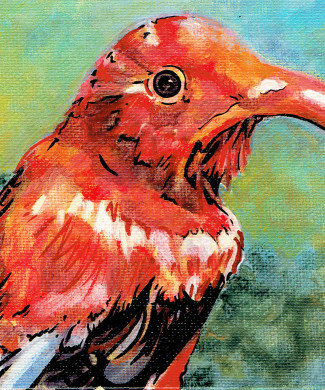 The area has been restored to the natural environment of the ‘alalā and is protected in an effort to help this beautiful bird thrive and once again repopulate the Big Island of Hawai’i. 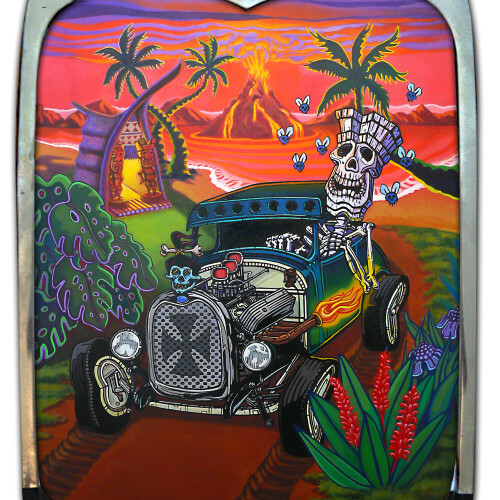 This piece is painted with acrylic and enamel on panel. 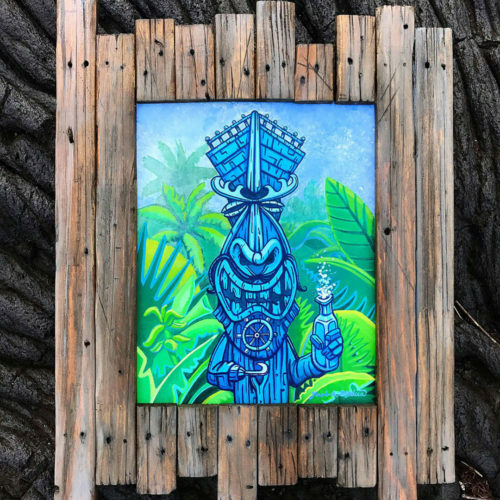 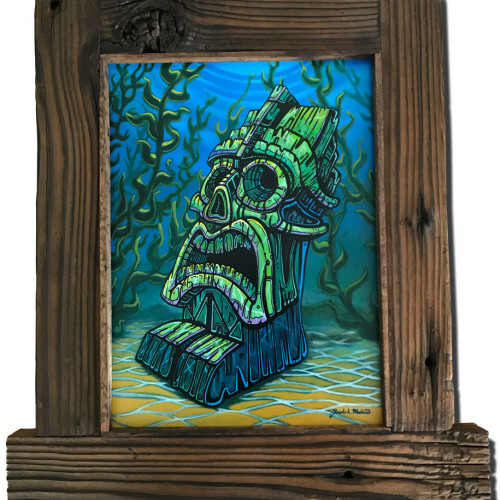 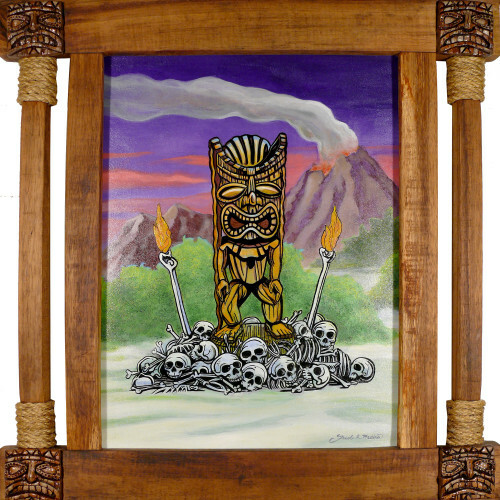 The frame is custom made out of reclaimed Koa and is meant to reflect the native Koa tree represented in the painting. 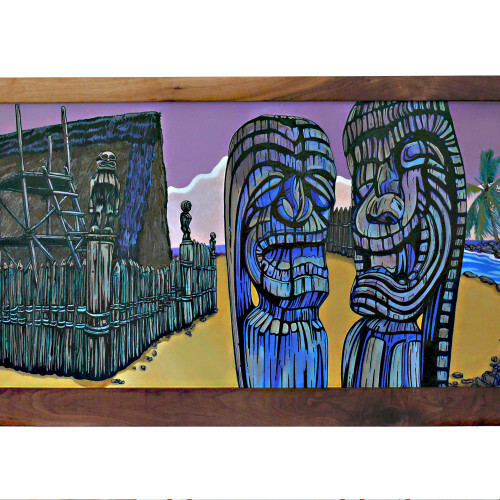 The original is available for purchase at the Volcano Art Center located in Hawaii Volcanoes National Park, or on their website here. 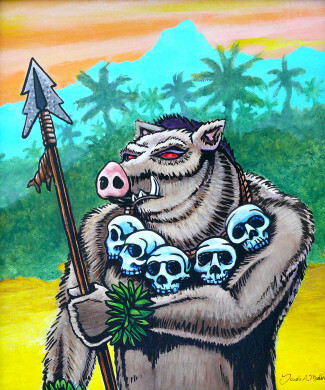 Kamapua’a is the shapeshifting boar god in Hawaiian mythology. 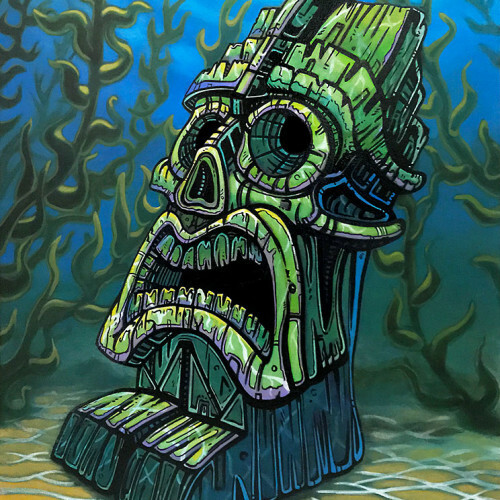 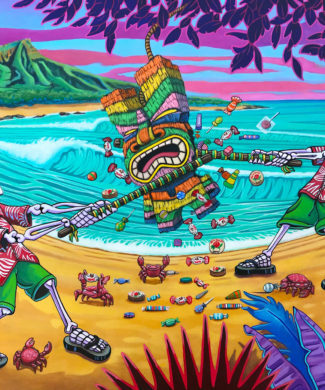 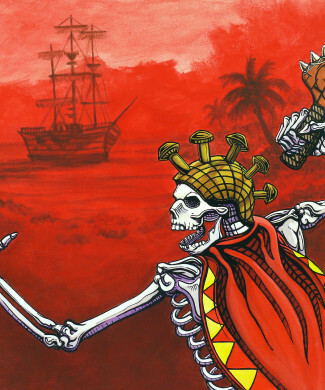 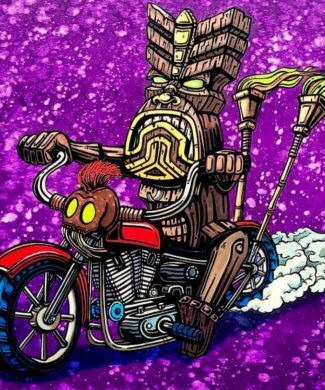 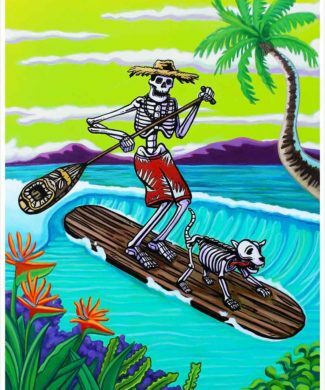 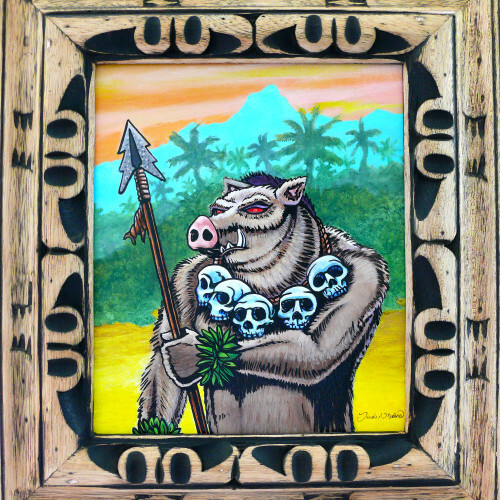 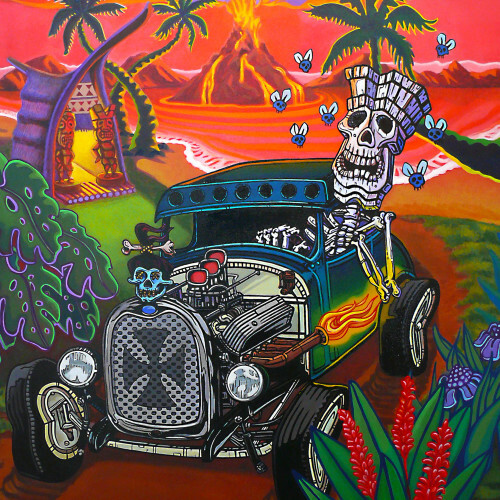 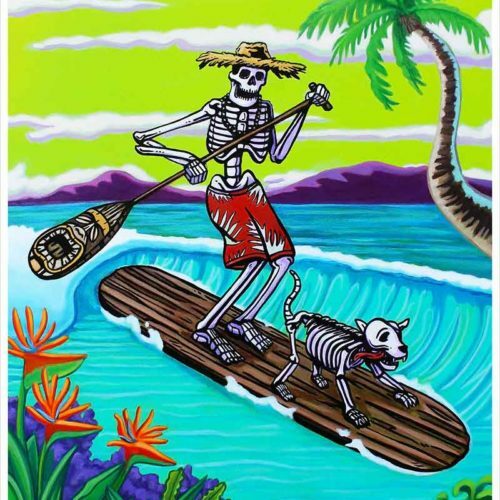 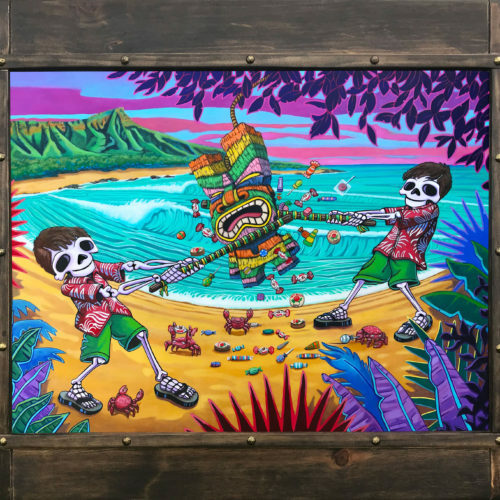 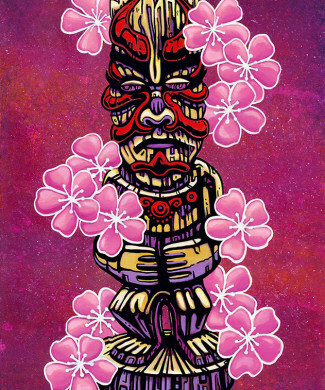 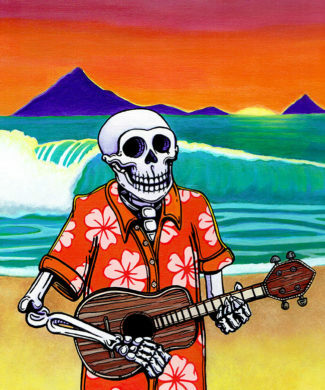 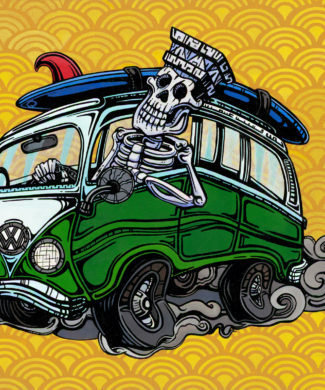 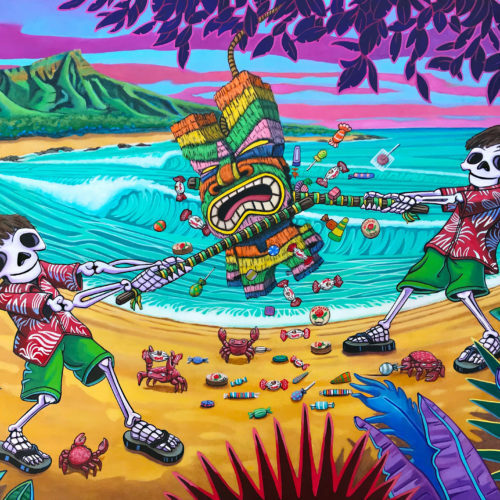 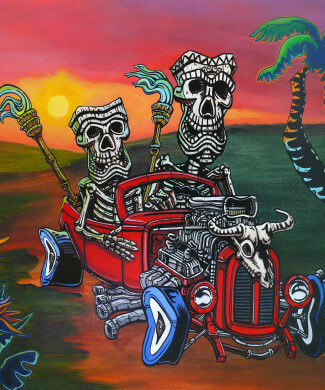 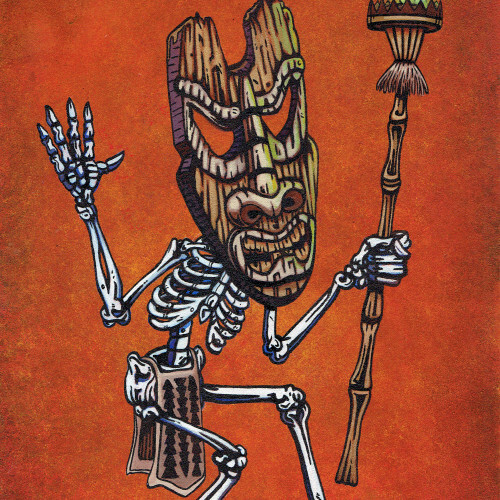 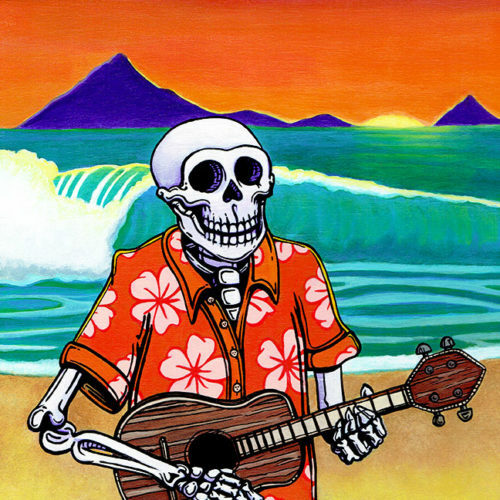 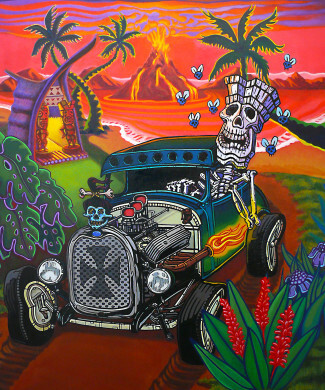 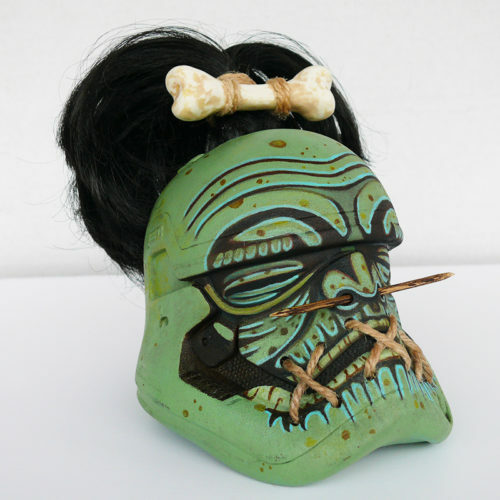 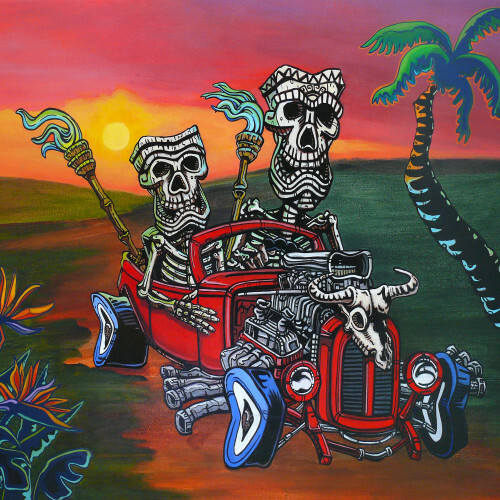 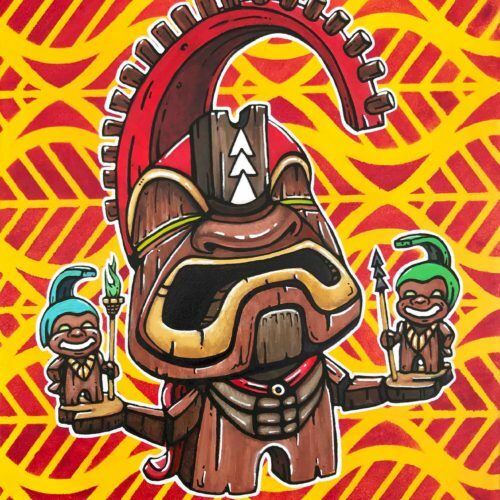 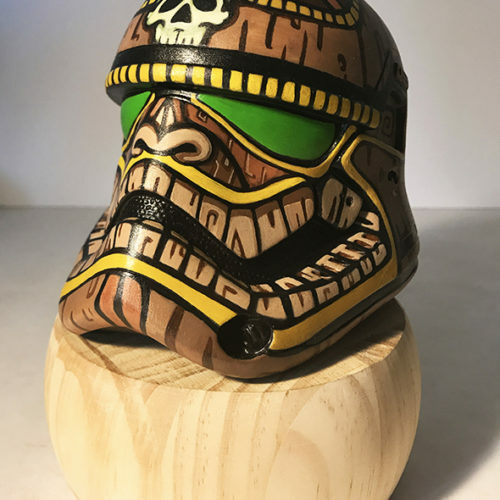 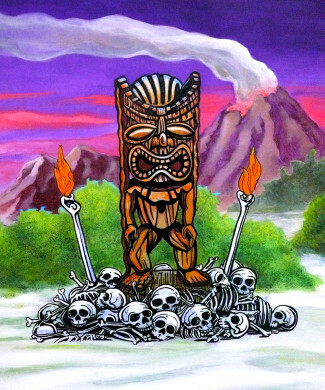 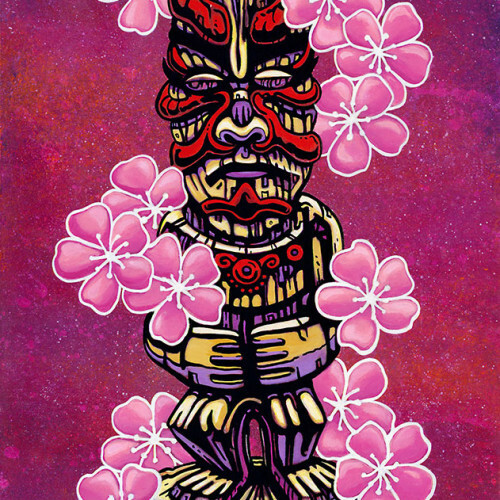 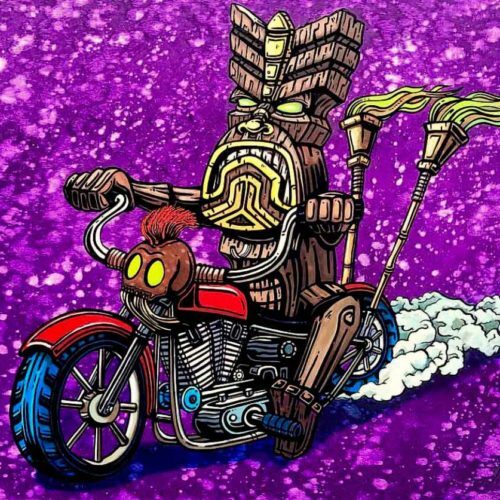 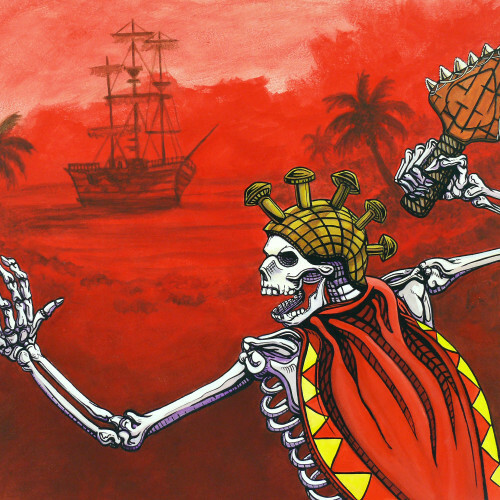 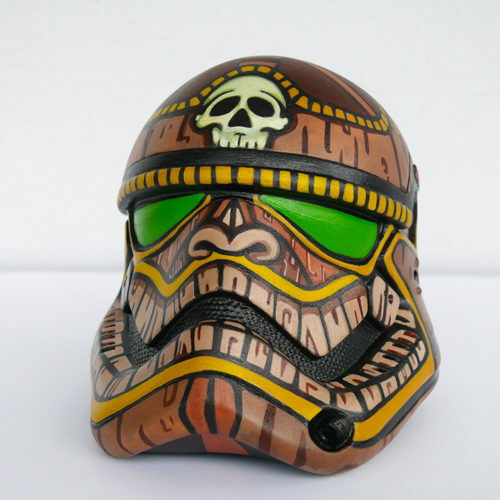 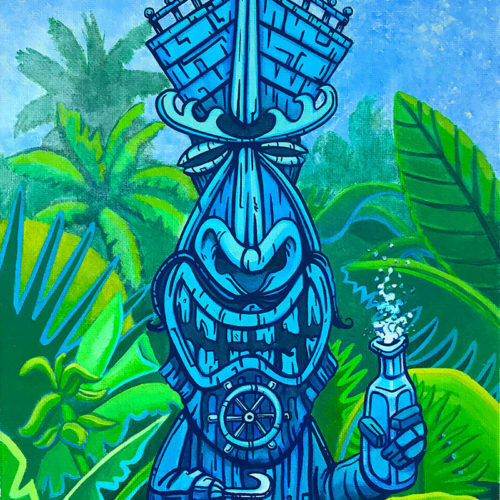 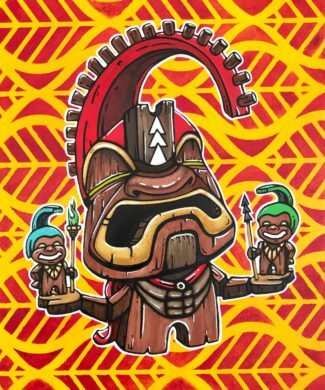 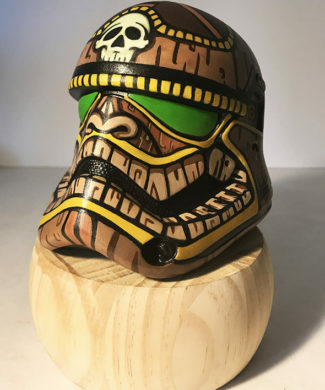 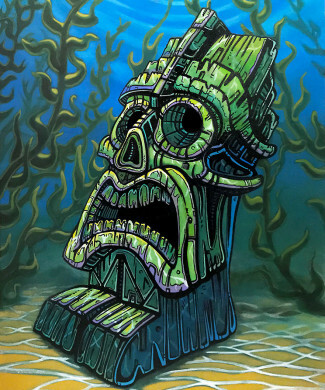 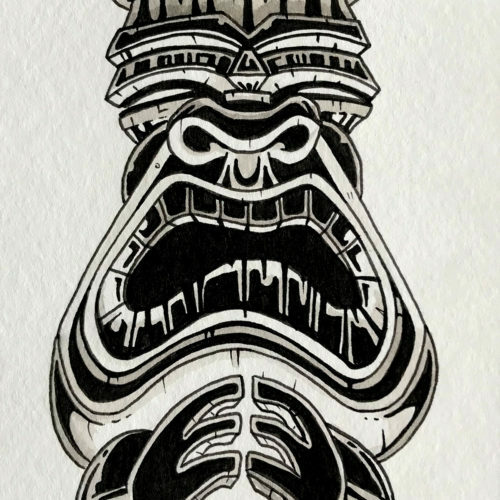 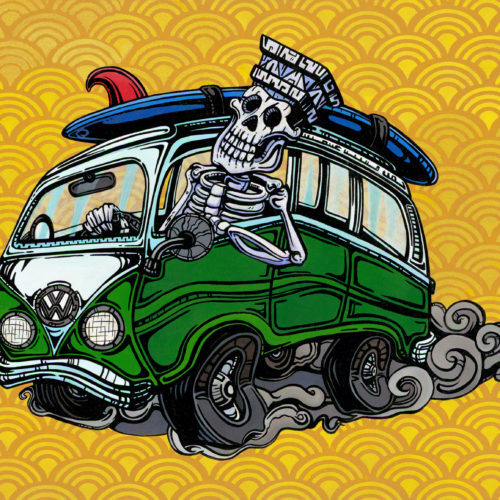 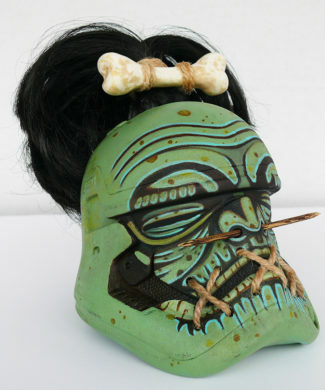 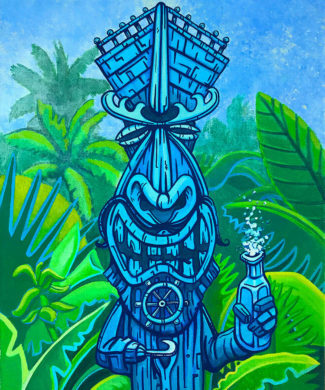 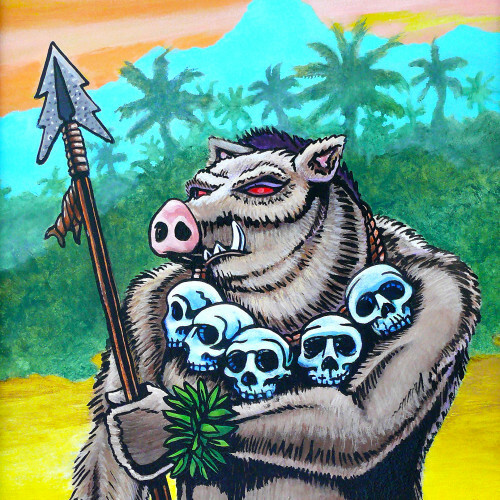 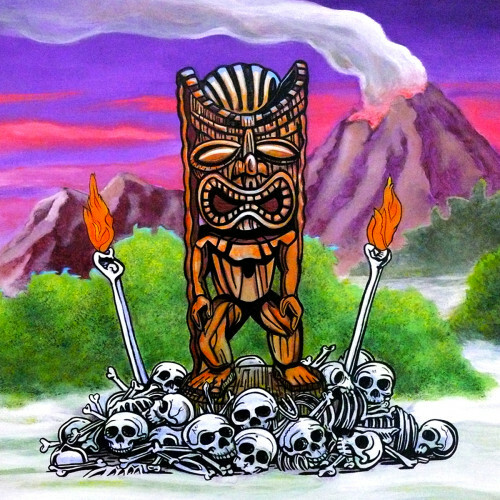 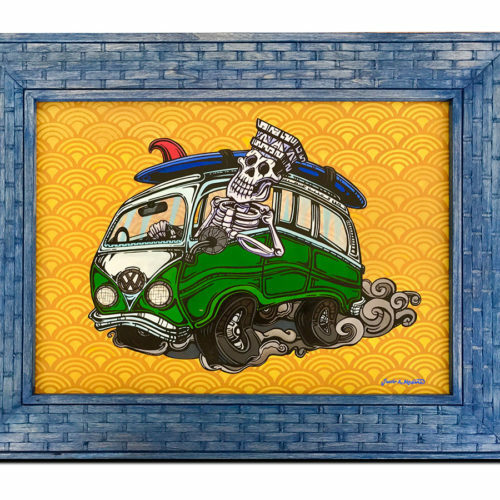 This piece references to him while taking a twist on the cultural significance to pig hunting in Hawaii and combining it with a hint of Day of the Dead imagery.He is the hunter of hunters and he wears skulls as trophies around his neck of all who have attempted to serve him for a Luau. 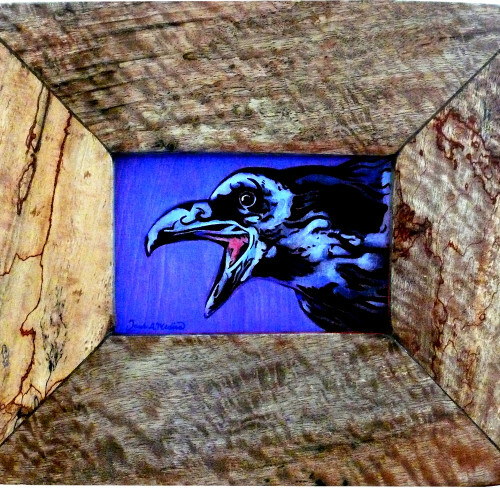 This work is painted on birch panel with acrylic and enamel and measures 10″x12″. 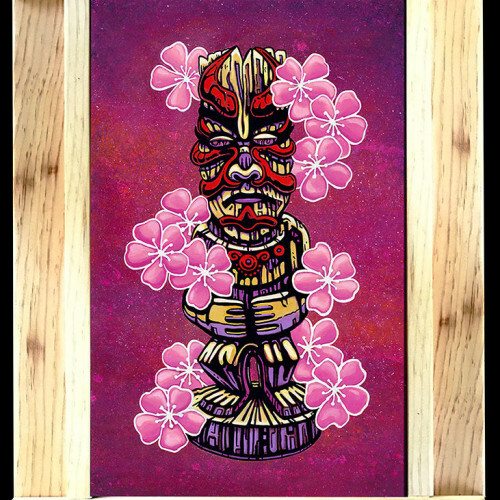 It comes in a reclaimed wood frame that is decorated with beautifully carved designs bringing the total size to 15″x17″. 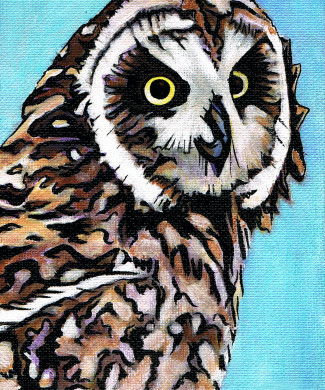 The Pueo is a short-eared owl that is endemic to the Hawaiian Islands. 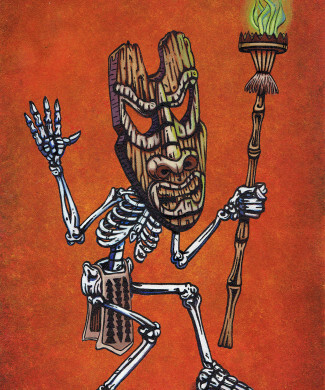 It is considered an ‘aumākua (ancestor spirit) and is endangered on the island of O’ahu. 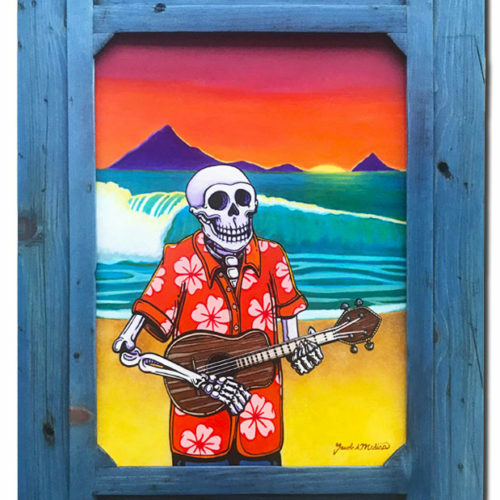 It is painted with acrylic and enamel on a 5″x7″ canvas panel in a rustic wood frame. 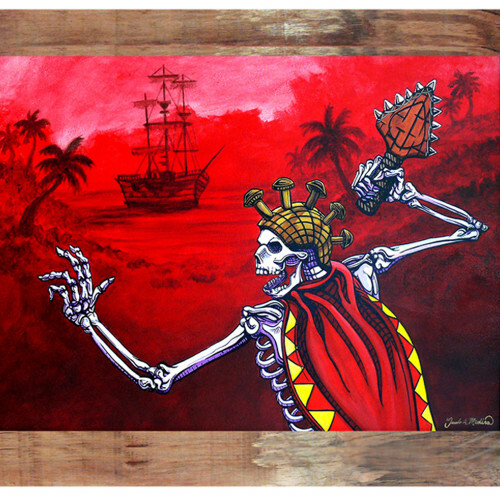 Although the Original has sold, Giclee prints on canvas and paper prints are still available. 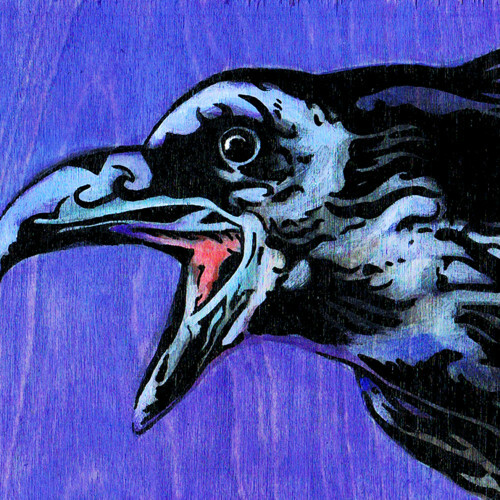 The Hawaiian Crow or ‘Alalā is endemic to the Hawaiian Islands and is considered by natives to be a family god or ‘aumakua. 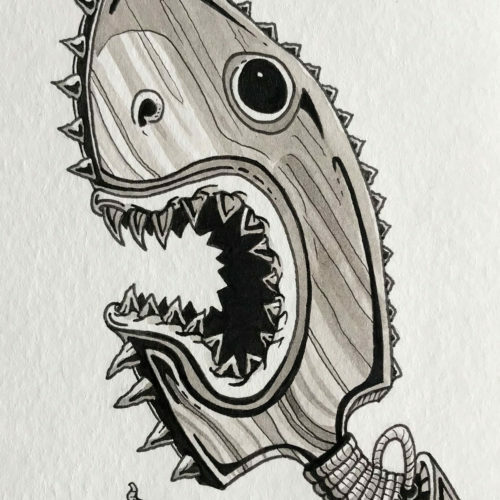 Unfortunately it is extinct in the wild and there are only about 150 left in captivity! 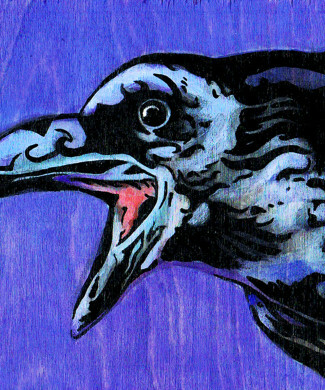 This painting is 4″x6″ on wood with an acrylic underpainting and is enhanced with black enamel. 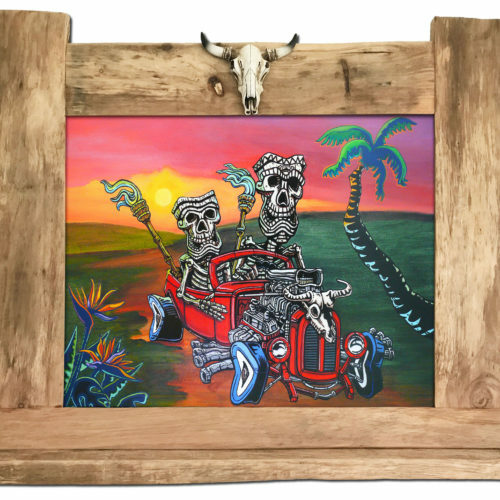 It comes in a custom built mango frame bringing the total size to 8″x 10″. 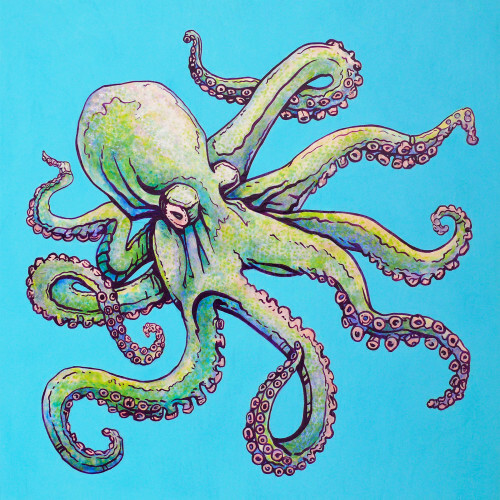 Although the original has sold canvas giclee and paper prints are still available.